I’ve always loved the look of lemon bars, but the taste, eh, not so much. Whenever lemon bars are on a platter I admire their beauty but always pass on them. In fact, I don’t think I’ve even had a bite of a lemon bar since I was a kid. So when I found myself with a few extra lemons after making lemon cakes for my dentist (I know, the irony), I thought I’d give lemon bars another try. I remembered my friend Jami had mentioned her killer lemon bars before so I asked for her recipe. When I brought these bars into work I put a note on the container that said “Ugly Lemon Bars” because I wasn’t happy with the look of the sliced bars. I was anxious to taste them and cut them before they were completely set, thus ruining the smooth pretty look of the glaze. Yes, these bars are glazed rather than sprinkled with powdered sugar, which is a plus in my book. I hate powdered sugar on things. Not only does it get all over the place, there is no way to neatly bite into anything with a powdered sugar top. Anyway, I put these bars in the kitchen at 8:00 a.m. and they were gone before noon. And all morning long people came up to me and said, “The Ugly Lemon Bars are soooo good!” There were even a couple of people who said they don’t usually like lemon bars, but they really liked these. For the record, I still don’t like lemon bars. I’m a huge texture person when it comes to food, and the lemon bar filling I just find odd. Some people may say I am odd, but whatever. Preheat oven to 350F. Mix together the crust ingredients with a pastry blender or fork until crumbly. Press into the bottom of a 9″x13″ pan. Bake for 20-30 minutes or until crust is light golden brown. Mix together eggs, sugar, flour, and baking powder thoroughly. You can just stir it all together with a whisk. Add lemon juice and beat well. Pour over warm crust and return to oven. Bake 20-30 minutes. (Don’t let it get too brown.) Cool completely. Whisk together powdered sugar and lemon juice to make a relatively thin glaze. Drizzle (or spread) over the bars. Allow glaze to dry, then cut into small squares. Yields 40-48 small lemon bars. Glad they worked out! Your glaze is more opaque than mine usually is. Wonder why? Bet it tasted great. I can tell you why! Because I didn’t measure the lemon juice and accidentally poured in all of the juice that I had squeezed, so then I kept adding powdered sugar until it got to a consistency I thought would work. Your filling looks incredibly dense, almost like a lemon brownie, yum! I can’t wait to try this, out to buy some lemons now! I love lemon and lemon curd, but I find that the lemon filling on lemon bars is simultaneously too dense and not flavorful enough. Often they just don’t taste enough like lemon to cut through the raspberry topping or glaze that is put on the bars. I think I’ll have to tinker around and see if there is a way of making it more like a lemon curd filling with a bit more stability. YUM. I LOVE lemon bars and these look amazing! Making these soon!!! These look great! I typically love all things lemon but, like you don’t enjoy the texture of lemon bars. They always seem mushy & pasty. But the texture of these bars looks a lot denser than usual. I’ll be giving them a try with the extra lemons in our kitchen. 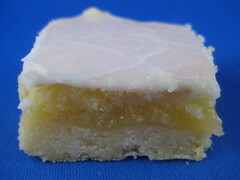 I always had the same issue, lemon bars looked good but tasted either too crumbly or too sour. This recipe might be just the right answer. I got to try it and see how it turns out. I got lot of organic and juicy lemons to make this and more. Thanks for sharing.